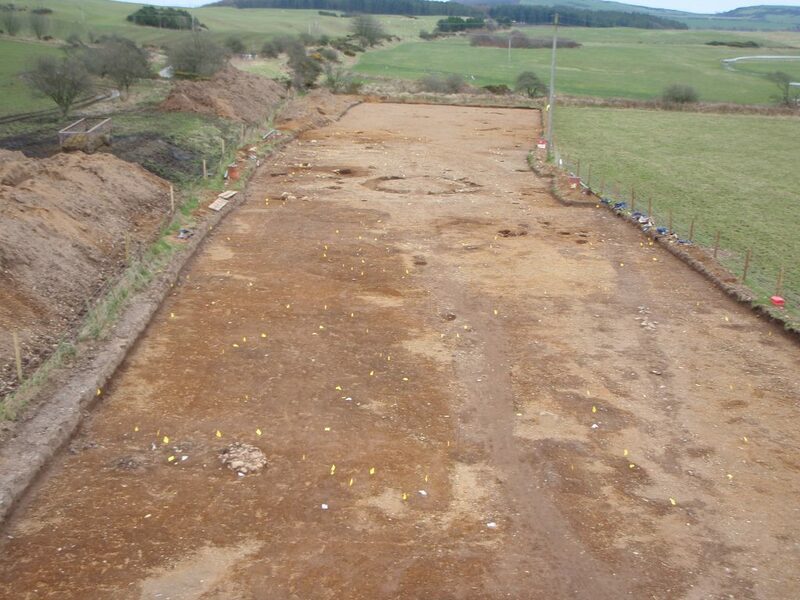 Prior to the construction of the A75 Dunragit Bypass, GUARD Archaeology undertook archaeological investigations uncovering a wealth of prehistoric archaeology. 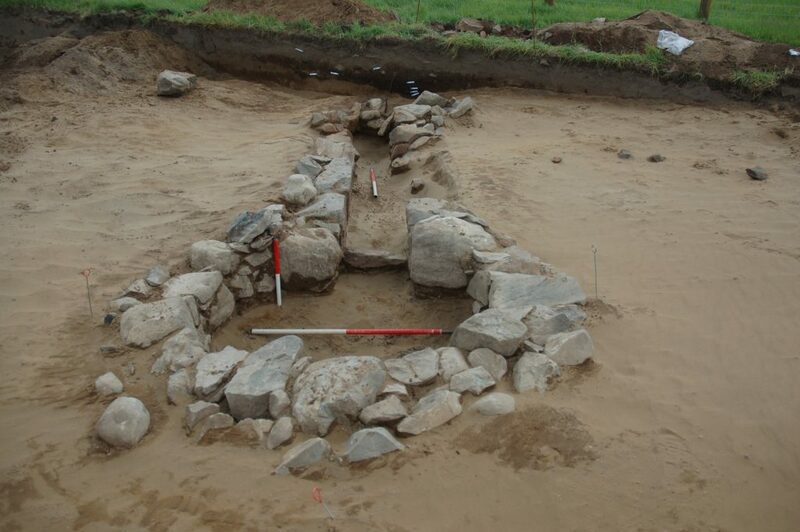 The earliest settlement in Galloway, a Neolithic/Bronze Age ritual landscape, two Bronze Age cemeteries and an Iron Age village were uncovered thereby labelling it the ‘Prehistoric Heart of Galloway’. Following the preparation of the interim report, a Post-Excavation Research Design was prepared that lays out the key questions we hope to answer and which identifies the various types of specialist analysis required to answer these questions. The main objective of the post-excavation work is to extract the full extent of information and provide as much knowledge as possible from the material recovered from the excavation phase. This new information will be assessed in line with current research objectives and will result in the creation of a permanent record within the public domain, of all the archaeology encountered along the route of the A75 Dunragit Bypass. how environmental factors have affected the location and viability of settlement across the area. We are excited to announce that post-excavation work began in October 2018. This entry was posted in Blog on April 22, 2019 by Author. Due to the fragile nature of some of the artefacts recovered from the Dunragit sites, specialist conservation was undertaken. These included a ceramic vessel, originally block-lifted on-site from a late Neolithic/Early Bronze Age cemetery at East Challoch, which was then excavated and re-assembled. 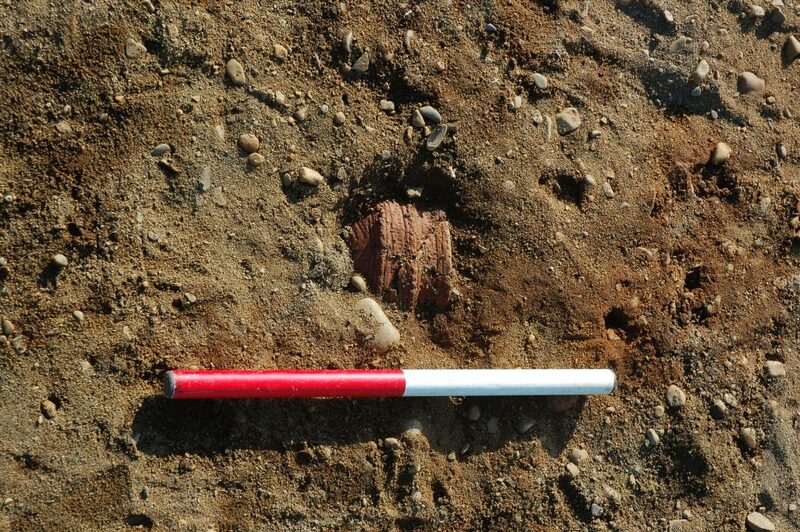 A Romano-British copper alloy pin recovered from the Iron Age settlement at Myrtle Cottage was cleaned and stabilised. 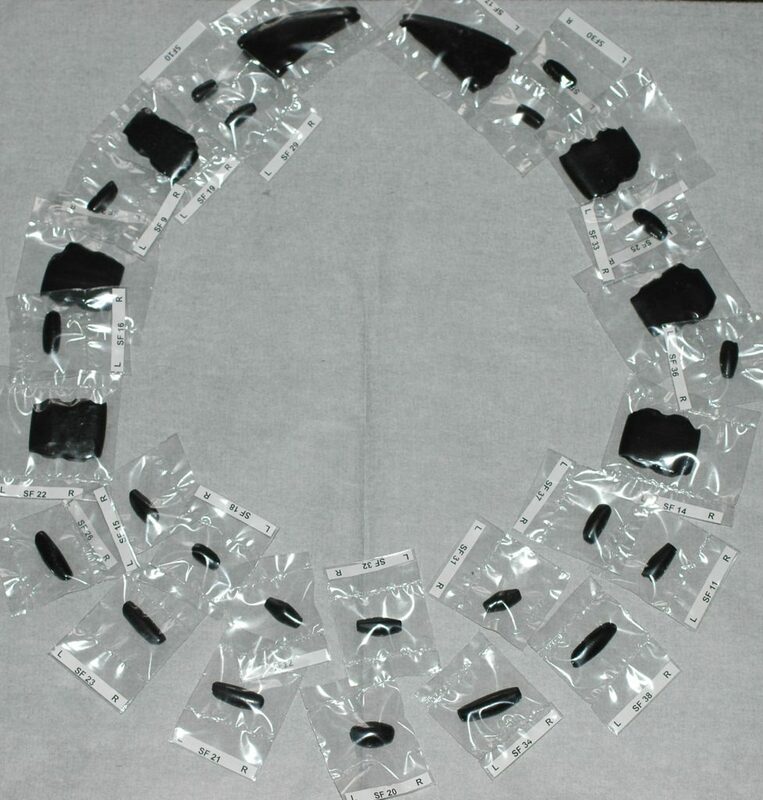 But the most significant artefacts to be recovered were 167 pieces of jet again from the Neolithic/Early Bronze cemetery at East Challoch, which appear to represent two necklaces. In the case of one of the burials, a matching bracelet was found. Additionally, the two separate graves each contained a ceramic vessel and a worked flint tool. The jet was conserved as a precaution to consolidate the material, to reduce the risk of further deterioration, and to facilitate preliminary analysis. This entry was posted in Blog on April 19, 2019 by Author. The archaeology discovered during these works represents a rich prehistoric occupation of this area of the Dumfries and Galloway coastline over some eight millennia. 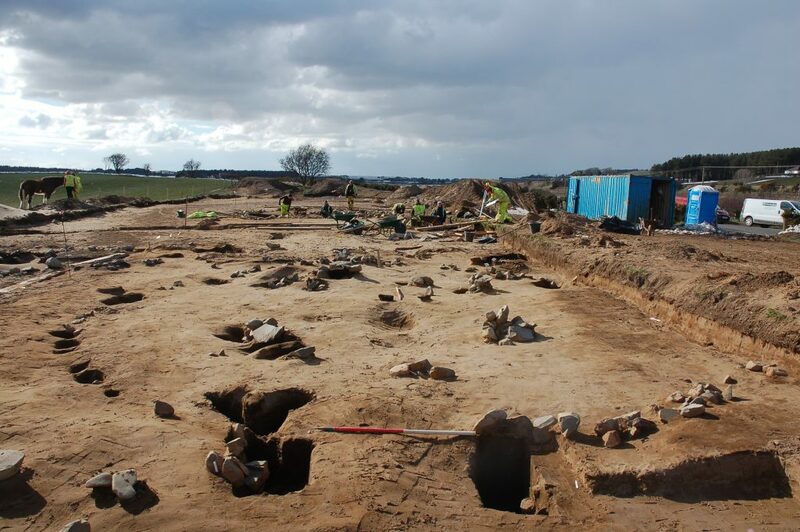 Among the findings were Mesolithic and Neolithic structures, a Bronze Age funerary complex including urn cremations and grave goods such as jet beads and flint tools and an extensive unenclosed Iron Age settlement. It is important to realise that the archaeological excavations at Dunragit predominantly gathered tangible archaeological evidence. This evidence needs to be analysed to make sense of what the archaeological remains mean. So the archaeological fieldwork is just the beginning of a long process of investigation. Once all of the archaeological fieldwork had been completed, the GUARD archaeologists prepared an interim report. This is termed a Data Structure Report and provides the initial results of the fieldwork. The main purpose of this report is to provide a record of the archaeological features that have been excavated, showing where these features are and offering preliminary interpretation. The Dunragit excavation interim report is important for the subsequent specialist analyses of the finds because it shows the archaeological context from which each artefact was recovered. This entry was posted in Blog on April 18, 2019 by Author. The construction phase involved a team of GUARD Archaeologists monitoring the topsoil stripping and dealing with any archaeology as it was encountered. Following on from the 11 areas expanded earlier, and using the findings from the evaluation to highlight areas of greater archaeological potential, the construction phase revealed further archaeology extending outwith each key area. 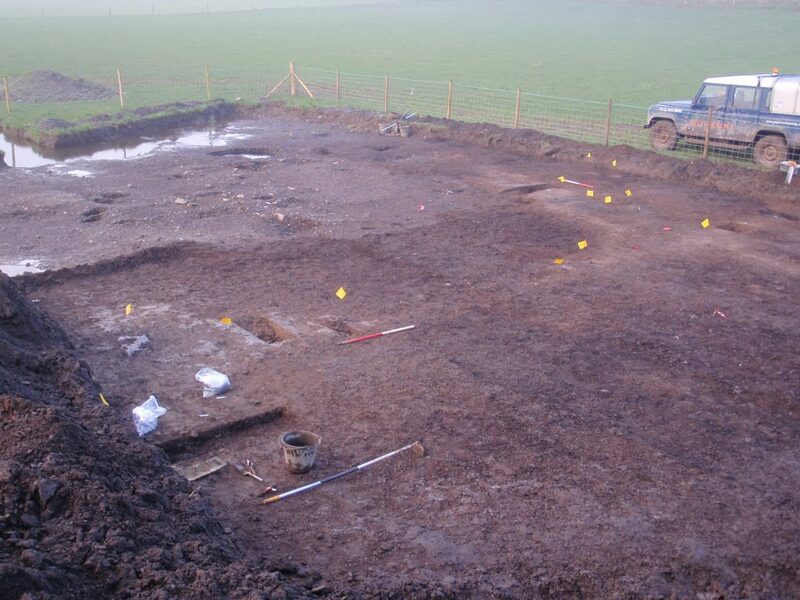 For example, the removal of topsoil to the south and west of the original Mesolithic site revealed a continuation of Mesolithic features, including further structural remains, bringing the total potential house structures to three. Employing a grid system across the area, lithic artefacts were recovered in layers and their distribution mapped. Significant quantities of lithic material were recovered – over 13,500 pieces not including the material recovered from the first house. 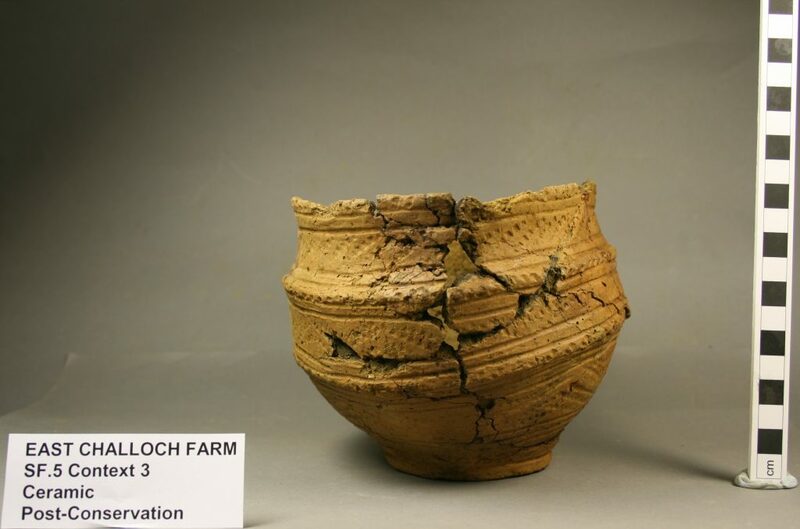 Further Neolithic archaeology was uncovered in proximity to the East Challoch site and dates to the Beaker period (c. 2500 BC) burial contexts were encountered with finds such as Jet bead jewellery, Beaker pottery and flint artefacts. 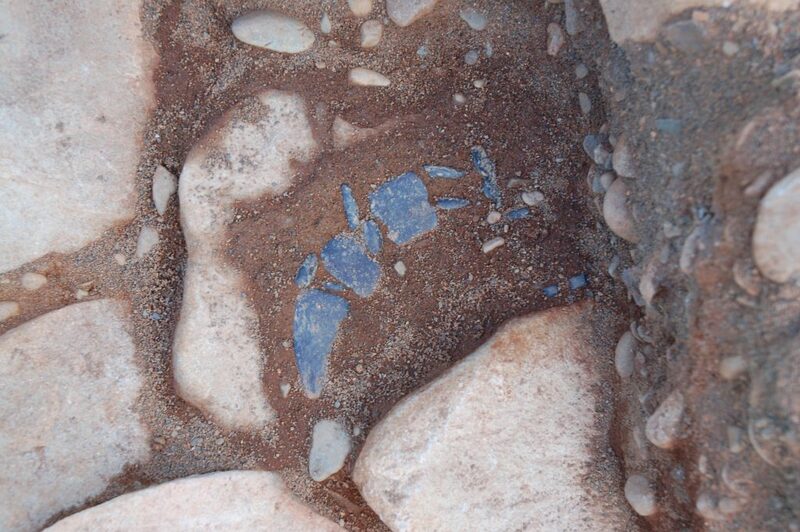 In proximity to the Boreland Cottage Upper site, further Bronze Age cremations and related features were uncovered. The expansion of the Iron Age site at Myrtle Cottage revealed a kiln and other features related to the Iron Age settlement site. This entry was posted in Blog on April 17, 2019 by Author. The eleven key areas of archaeological significance comprised a range of Mesolithic (8000-4000 BC), Neolithic (4000 – 2400 BC), Bronze Age (2400 – 700 BC) and Iron Age (700 BC – AD 500) findings. One of the most interesting results from this phase of work was a Mesolithic settlement revealed at West Challoch to the south-east of Dunragit village. Mesolithic settlements in south-west Scotland are extremely rare and up until our excavations, have consisted solely of scatters of lithic material and hearths but no actual structures. However, a Mesolithic circular structure and associated large pits and ditch gully were encountered during the initial Dunragit evaluation along with a total of 166 fragments of un-stratified lithic material from the topsoil. The Mesolithic house consisted of a sub-circular arc of six post-holes on the south west, with the possible return on the north-east comprising of two post-holes. The area within the structure appeared to be approximately 3 m in diameter creating an internal space of approximately 7 m². The post-holes appeared to be set in four pairs with each pair of posts set approximately 0.4 m apart. No obvious sign of an occupation layer survived within the interior of the house but a series of sampling grids were laid across its footprint to extract lithic artefacts. Furthermore, two layers of multi-element samples were taken at 0.2 m intervals in the attempt to establish evidence of occupation and differential uses within the structure. No internal hearth was visible within the structure, with the only direct evidence of a hearth a few metres to the north-west. An accumulation of worked lithic and debitage was noted around the north side of the structure concentrated around two of the post-holes. One of the most striking artefacts recovered was a perforated stone adze.of the structure concentrated around two of the post-holes. 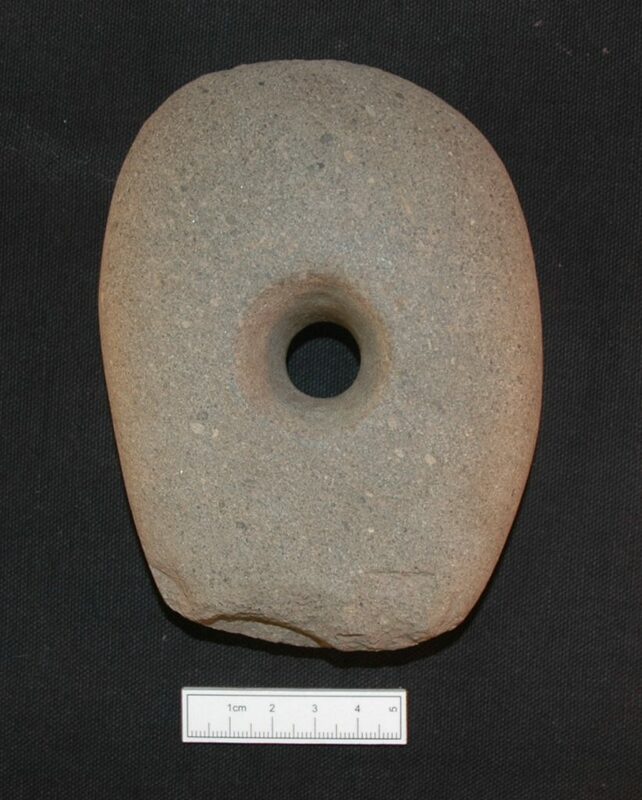 One of the most striking artefacts recovered was a perforated stone adze. A series of four preliminary dates were obtained during the excavation for four separate deposits including one posthole, a pit and two layers from the hearth. The calibrated radiocarbon dates ranged between 7056-6825 BC, 6830-6643 BC, 6867-6696 BC and 6849-6656 BC. These demonstrate that this Mesolithic structure is the earliest house discovered in south-west Scotland to date. But that wasn’t all, the other areas revealed a wealth of other prehistoric activity, including possible Neolithic structures (East Challoch), a Bronze Age cemetery complex (Boreland Cottage Upper), a series of burnt mound sites (Boreland Cottage Lower) and an Iron Age settlement (Myrtle Cottage). This entry was posted in Blog on April 16, 2019 by Author. 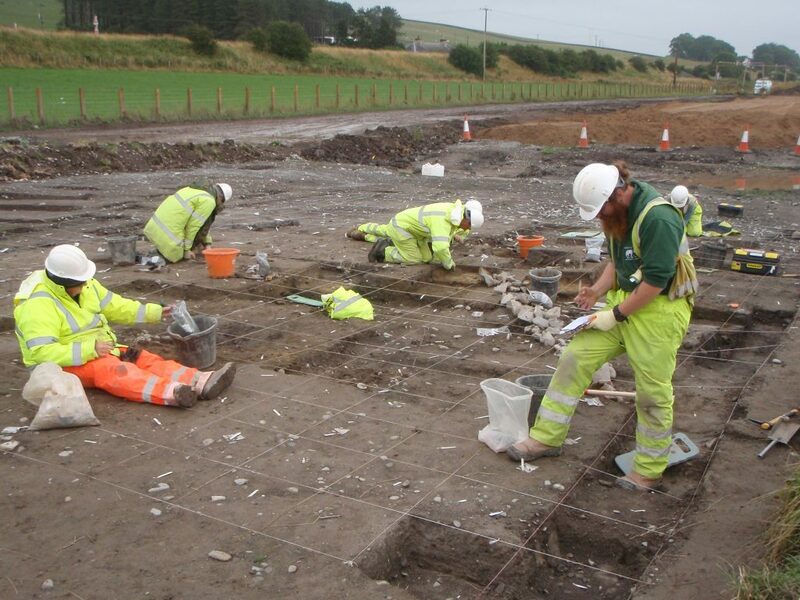 Amey plc and a small GUARD Archaeology team led by Warren Bailie began an archaeological evaluation of the proposed A75 Dunragit Bypass route in Dumfries and Galloway in August 2012. 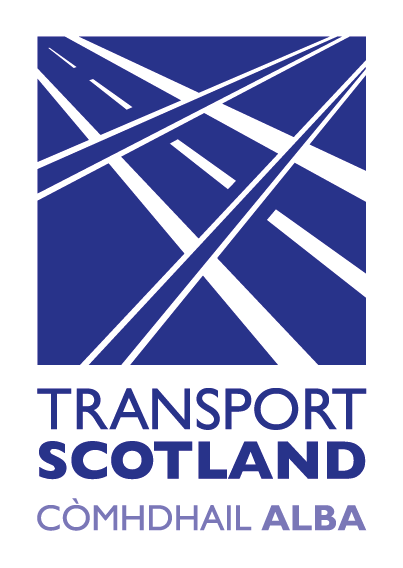 This work was undertaken on behalf of Transport Scotland in advance of the main construction works commencing. Archaeological evaluations are often required where there is a potential for unknown archaeology to be encountered. Historic Environment Scotland and the Dumfries and Galloway Council Archaeologist considered there was a potential for unknown archaeology along the route of this bypass given that significant Neolithic archaeology survives at Dunragit. This known archaeology is represented by three scheduled monuments at the west end of the bypass route. Flanking the south side of Dunragit are the cropmarks of a large Neolithic ceremonial timber circle, which was excavated by the University of Manchester in 1999-2002. The most prominent of the monuments at Dunragit is Droughduil Mote, a steep-sided and flat-topped mound, long thought to be an Anglo-Norman motte of the 12th century. It was discovered that this was instead Neolithic and likely related to the nearby ceremonial timber circle. The third scheduled monument, the Drumflower complex, 500m west of Dunragit village, was again identified by crop marks appearing in aerial photographs. 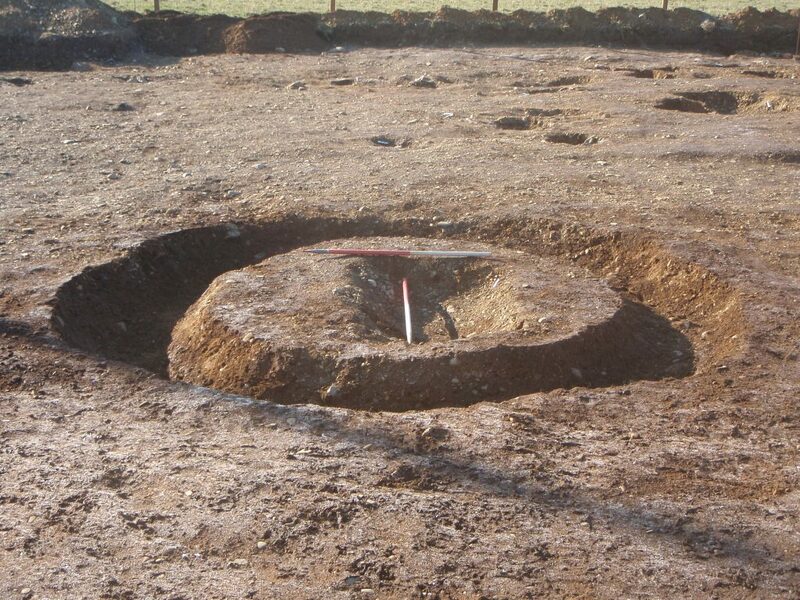 This is a rectilinear enclosure defined by close-set pits and may also be Neolithic in date. Prior to work starting on all major road projects, Transport Scotland will undertake an investigation to ascertain whether there is any archaeological material at the location and take steps to ensure that anything found is excavated and preserved where necessary. 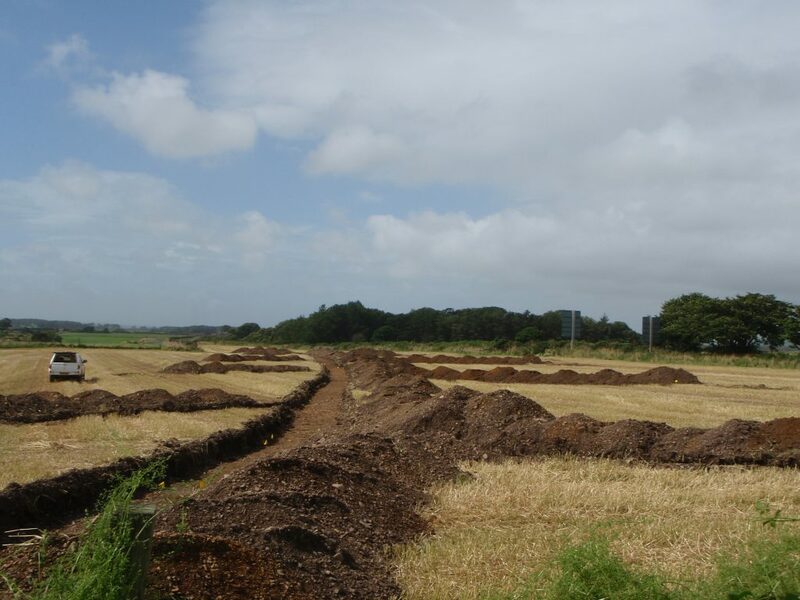 These investigations for the Dunragit Bypass revealed that the proposed route took it through the Neolithic landscape characterised by the Dunragit and Drumflower complexes and Droughduil mound. The main aim of the archaeological evaluation was therefore to establish the presence and extent of both the known and the unknown archaeology along the course of the route. 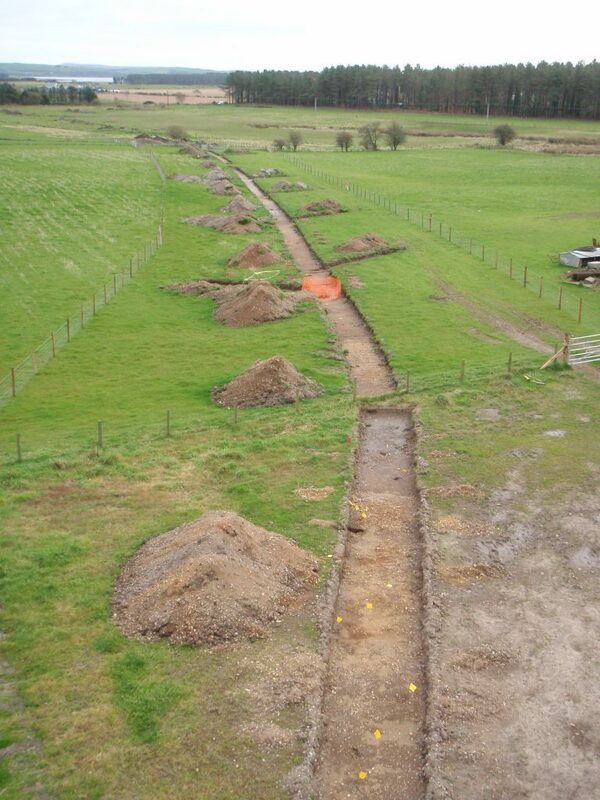 The trial trench evaluation investigated a 10% sample of the 7.4 km long route. A total of 241 trenches were excavated by machine excavator under the watchful eyes of the GUARD Archaeologists. Eleven key areas of archaeological significance were uncovered.